Kara-Leah: Can you introduce yourself to The Yoga Lunchbox readers? Who are you? Gina: My name is Gina Brezini. I have two passions—for creativity and for spiritual development. As I write this, it occurs to me that both are rooted in authenticity. So, it seems that what I deeply care about is authentic expression. I am committed to teach it in ways that empower, inspire, and create transformation in people’s lives. While I’ve enjoyed a successful career in the arts, I also have been dedicated to my conscious spiritual journey. On this journey, I have studied a variety of mystical and psychological subjects: from ancient philosophical teachings to yoga and relational dynamics. I was born in Bulgaria where I earned a master’s degree in Fine Arts. After immigrating to the U.S., I graduated in Spiritual Psychology from the University of Santa Monica in California, in 2006. My journey continued in India and Sri Lanka. There I studied Eastern spiritual wisdom and was introduced to potent healing techniques. This is where I deepened my practice of yoga, learned to work with energy and expanded my knowledge of the mystical. I’ve walked barefoot at most temples in both countries and spent time in an ashram in South India where I was exposed to the ancient wisdom of Indian sages. I am officially qualified to give dikshas—a form of “blessings” that are believed to change habitual behavior by restructuring neural pathways. During the war in Sri Lanka, I worked with child-solders in attempts to assimilate them back into civil life. I have also participated in facilitating workshops for women in one of California’s high security prisons, teaching them how to counsel and support each other. Currently, my private practice is based in New York City. I also coach clients throughout the U.S. and Europe via Skype. I deeply believe in the value of the work I am doing. I have created a Circling community in New York and I am bringing this life-changing practice to Indonesia through our Bali Magic Retreat in September. Kara-Leah: This retreat is a Yoga and Circling Retreat - what does the yoga component consist of? Gina: Yoga is essential part of this retreat. It aims to open and prepare us physically and energetically for deeper and more thorough healing. It helps us to embody and integrate growth fully, and to create change on all levels. It makes us a vibrational match to wellness. It creates a state of full-body well being. It releases stress—to allow us to be more present and more available to the opportunities for growth. The elegant property I have chosen for this retreat has a beautiful outdoors yoga shala surrounded by luscious nature. We offer daily yoga, taught by highly qualified local yoga masters. Ubud is a renowned center for training yoga teachers from all over the world, and we have selected the very best. In addition to yoga, guided meditations are incorporated into the program. They take place in the beginning of each Circling gathering. Kara-Leah: And what is Circling? While I was in circling training, my finances were not in a great shape. I went to the bank in hopes of a business loan. I have never before borrowed money and I felt insecure, intimidated and very uncomfortable. The woman who handled the application process seemed unfriendly, harsh, and behaved in a standoffish way. She asked a series of rapid-fire questions that I perceived as interrogation. In reality, I was ashamed that my business was not doing as well as I wished it did. One of the things we learn in circling is to use the expression of negative emotions to create connection. And that is exactly what I did. As I began to circle the banker, she looked at me in dismay and suddenly softened. Simultaneously, I felt more relaxed and less judgmental. My shame disappeared. My anger was gone. And somehow, miraculously, I had let go of my fear. As I continued using circling skills, the energy shifted and the whole dynamic of the interview changed. To my surprise, the woman apologized, opened up and became friendly. “I’ll try to get you a bigger loan”—she offered while I could hardly believe what was happening. She began talking about her passion for photography and we created a closer bond. We ended up having a really warm conversation and feeling truly connected. Kara-Leah: How did you discover Circling? Gina: Two years ago my therapist mentioned a new modality: “It is highly effective in increasing intimacy by learning how to be with others without losing yourself… But it isn’t for the faint of heart”—she said. There was an upcoming Circling Weekend in New York, for the first time. I am not impulsive, but I trusted the intuitive hunch I felt. “I’m in”—I decided instantly and signed up for the weekend. I had no idea what to expect. Curious, I later searched online but there was very little information about circling. Yet, I trusted the pull. The first circle I witnessed was my own. It was one of the most empowering experiences I have ever had. In fact, it was the very first time I felt powerful. I felt accepted. I felt revered. I felt I belonged. Kara-Leah: Why did you make the decision to train in Circling? Gina: After experiencing it, I felt an immediate and incredibly strong pull to continue with this process. It was unmistakably clear that it is my Soul that’s guiding me in this direction. This process was helping me to step into my power and to live from it. I had a strong desire to teach others to do this. I knew with my heart that I have finally found my purpose. I believed that Circling was the last piece of the puzzle that completed my search for my mission in life. I had no doubt that this is the work I am here to do. Kara-Leah: What impact has Circling had on your life? Gina: Ah, where do I start?!... Practicing Circling has basically transformed my entire life. It has changed the way I relate to myself, to others AND to the world. One of the things that Circling does is to eliminate blind spots and help us see what we haven’t been able to see before. During one of my most challenging circles, I discovered that for most of my life, I have perceived the majority of people as enemies, and life as a battlefield. As a child I had suffered severe abuse and continuous neglect. As an adult, I have been fighting for everything. While this led to many achievements, my relationships were not as I desired. Without personal happiness, there was not much satisfaction in my hard-won victories. Bringing my outdated perception of the world into consciousness prompted me to look deeper into personal issues related to it. This created the possibility for me to heal. As I started seeing the world through a different filter, I began making new choices. New opportunities opened up for me. I now experience the world more often as a friendly place in which people are on my side. I am able to notice and appreciate the support that is present in my life. I realize that I don’t have to do everything alone. I’ve opened up to the possibility that I can trust others. I have connected in new close friendships, attracted more available men, established mutually rewarding partnerships, started new businesses and created a community that grows rapidly and transforms people’s lives. In the past, my unconscious motivation was fear and survival. Now, what motivates me most is inspiration, vision and the genuine desire to contribute and co-create a more harmonious world. I am no longer hesitant to express what I feel, think and need. I now have the tools to do it in a way that creates connection. I can fully and fearlessly be ME. Kara-Leah: Why have you chosen to lead this retreat in Ubud, Bali? Gina: Bali is known as The Island of the Gods. This magnificent land is acknowledged as one of the most powerful energetic centers. I believe that when we are in a place with higher vibrations, the process of transformation accelerates and generates long-lasting effects. The intention for this retreat is to share memorable experiences and to facilitate transformation in the shortest span of time. That’s why we select destinations that hold undeniable spiritual power, calm the mind, heal the body and nurture the soul. Kara-Leah: Can you tell us what people can expect from the setting? Gina: This retreat will take place at an exquisite boutique property designed to help people embrace the beauty and bliss of Bali. 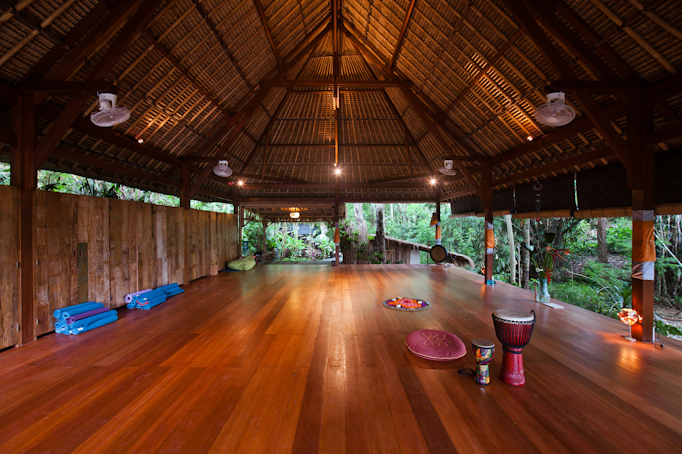 It is the perfect place to reconnect with a sense of wholeness, harmony and health. The property offers luxurious accommodations, organic food grown from its own garden and an ozonated swimming pool surrounded by bamboo, papaya trees and ginger plants. The main villa is nestled in plush tropical gardens, perched by a river. Located among rice fields are additional two-story villas overlooking a stunning lotus garden and a salt-water pool. Each floor has a light-filled “chakra room” with its own color and chakra symbols. The rooms are tastefully integrated with the resort’s beautiful landscape, maintaining harmony within the natural environment, embracing guests with a welcoming and peaceful energy. Kara-Leah: What's your favorite aspect of running a Circling retreat? Gina: Immersing into another culture enhances the already powerful process of Circling. It allows the welcoming of who we are while also enjoying and learning about a foreign country. Being together in a retreat setting and sharing fun experiences can create beautiful memories and friendships lasting a lifetime. My Circling Adventures partner, Alita, has the wonderful gift of making people feel special, cared for and welcome in a uniquely warm way. We both believe that Circling in nature has a bigger impact and accelerates transformation. We trust that pampering, relaxation and increased body care during transformational work can facilitate faster integration and support lasting results. Our desire is to provide everything for you, so all you have to do is show up, let go and go within. Last summer, when I was in Bali searching for the best location for this retreat, I found exceptionally powerful healers. I have personally met and experienced many of the most gifted light workers of this land, as I was deciding which ones to include. Among others, I have invited the High Priestess Ida Resi to perform purification and blessing ceremony. This alone is a rare opportunity for an extraordinary experience, as this young woman with remarkable personal story and amazing spiritual powers is not easily available to all. Kara-Leah: What kind of transformation do people experience after a Circling retreat? Gina: People say that after a Circling immersion they feel more present, more alive, more connected, and more loving. Many claim to have their lives changed in some way. Circling helps people to create deep meaningful connections, reveal and transform relational patterns and communicate the truth in a way that allows others to understand their point of view. They learn how to understand and accept others even when they feel triggered or don't agree. They often discover filters and blind spots that make it difficult to see, be seen and relate in fulfilling ways that support any relationship. They deepen their practice of relating authentically. Kara-Leah: Anything else you would like to add? Gina: Grounded in my desire to help others experience shifts in their own reality, I am dedicated to helping people step truly into their personal power and create a happier and more abundant life for themselves. My mission is to assist others to make new choices that inspire them to do the work they love, feel fulfilled, and live life on purpose. Bali Magic Yoga & Circling Retreat is YOUR opportunity to begin this important journey and to create desired changes in YOUR life!